I had a great time at 11th hostel! It's very well located in the center of the city, close to pretty much everything. The staff are super nice and helpful. Kitchen/common area are well equipped. Spacious dorm, the bed was comfy. Would definitely recommend! I will be back! Thank you! The staff were really nice and give good advice. 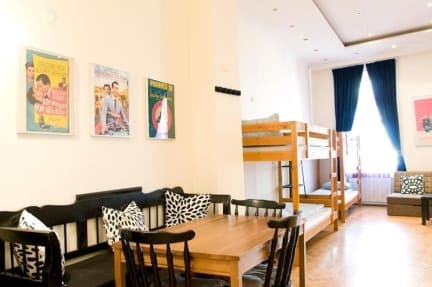 The hostel is amazing and well situated. The bunk beds need to be changed because they were unstables. Stayed at 11th Hour Cinema Hostel for the second time. Great value for money during the off-season. Well-equipped kitchen, nice and spacious common area. Literally several minutes' walk to metro station, 10 minutes' walk to the airport shuttle bus station. David was especially friendly, kind, passionate and welcoming. He painstakingly explained my everything while checking me in, going through all the important spots (attractions, supermarkets etc.) on the map. Professional but still sincere. Very good hostel and crew! Me and my friend enjoyed a lot the place and mainly the location. The crew of the 11th is really amazing and they are full time helpfull and friendly. So, I can recomend that place for everyonve who wants to came to Budapest. It's close to the mainly touristcs points and the place provides a really good acess to the ruin pubs. Arrived there at 11pm and they told us that we had to move to one of their air bnb cause there was smth wrong with our room.the air bnb was ultra dirty there was no chance to use that bathroom and shower and was only one double bed instead of 2 single. Pro: A decent location, staff was good and friendly. Contra: we booked a private room with shared toilet in a shared apartment. The worst part is the door of our room is inside another room, we have to go through a 7 bed dormitory to get in to our room. One of the bed is just in front of door, so when we open the door the first thing we see a person sleeping on it. We had to tilt to the right to go out. Upon asking the didn't chnge the room and said the hostel is supposed to be like this.